Fall has arrived, and school bells are ringing – so for this issue, we’re taking a back-to-school slant. David Redhage has been out teaching about increasing and conserving pollinator habitat. We share a presentation on establishing native pollinator plants organically that he gave on a recent NRCS webinar. Our Beginning Farmer & Rancher training program brought many farmers back into the classroom. Though it wrapped up four years ago, it was so popular that we still regularly field inquiries about it. 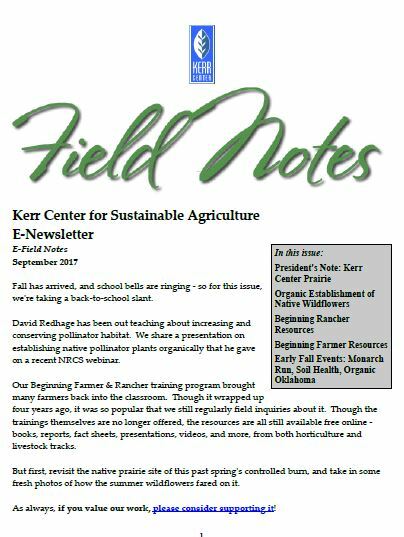 Though the trainings themselves are no longer offered, the resources are all still available free online – books, reports, fact sheets, presentations, videos, and more, from both horticulture and livestock tracks. But first, revisit the native prairie site of this past spring’s controlled burn, and take in some fresh photos of how the wildflowers fared on it.